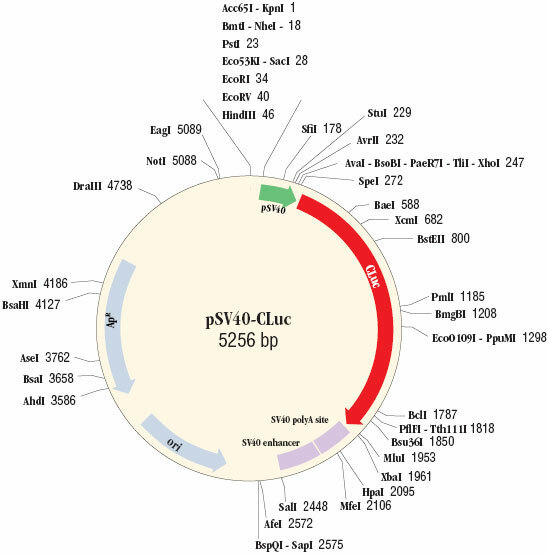 The pSV40-CLuc Control Plasmid is a mammalian expression plasmid that constitutively expresses the secreted Cypridina luciferase (CLuc) under the SV40 early promoter. 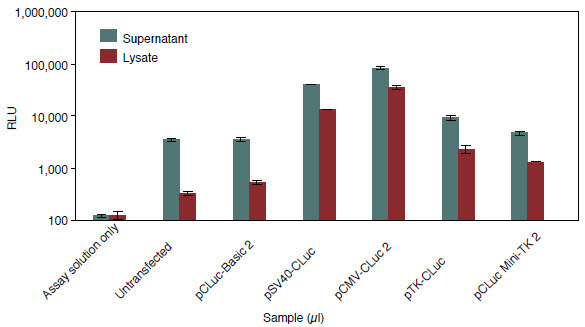 CLuc does not use the same substrate as other marine luciferases, e.g., Renilla and Gaussia. Therefore, it is possible to assay both CLuc and GLuc independently in cell culture medium from cells expressing both reporters. The pSV40-CLuc Control Plasmid is a mammalian expression vector that encodes the secreted luciferase from the Ostracod Cypridina noctiluca (1) as a reporter, under the control of the constitutive SV40 promoter. Cypridina Luciferase (CLuc) is a 62 kDa protein with a native signal peptide at the N-terminus that allows it to be secreted from mammalian cells (1) so that CLuc activity can be detected in the culture medium. There is a multiple cloning site (MCS) upstream of the SV40 promoter. The Cypridina Luciferase sequence is located downstream of the SV40 promoter (not shown); unique restriction sites are shown. The activity of CLuc is high and the CLuc assay is sensitive enough to detect very small amounts of CLuc enzyme activity. The pSV40-CLuc Control Plasmid can be transfected into cells using any standard transfection protocol. The pSV40-CLuc Control Plasmid can be used as a control for assessing the efficiency of transfection in mammalian cells. Plasmids containing other constitutive promoter elements are also available (see Related Products). CLuc can be used as a stand alone reporter or in conjunction with other compatible reporters such as Gaussia luciferase (GLuc)(2). CLuc and GLuc are ideally suited for co-expression as both are secreted and highly active enzymes providing ease of use and sensitivity. Nakajima, Y. et al. (2004). Biosci. Biotechnol. Biochem.. 63, 565-570. Can I make a stable cell line with pSV40-CLuc?